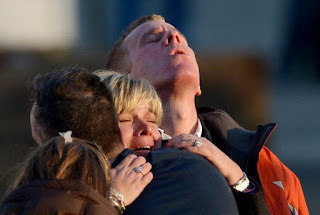 The whole nation is grieving the utterly senseless massacre of children and adults in Newtown, Connecticut. Many people are asking "Why?" and "How?" First and foremost, we must continue to pray for the affected families in Newtown, for days and months to come. I am confident that the Christian community in that region will respond in personal ways. I've not seen this type of public emotion and grief since 911. While the scale of this tragedy is smaller than 911, its impact is deepened by the targets of the killer…defenseless little children and teachers. When I came home Friday afternoon December 14, turned on the television, and began scanning news channels, I thought, "What has happened now?" When I learned that this was a shooting at an elementary school, I felt sickened. At 3:30pm, when I watched President Obama give his emotional statement, I broke and cried. I've witnessed violence. I've been on crime scenes and have seen gunshot wounds. I had difficulty processing in my mind that someone actually charged into a school and massacred little children. Certainly, violence is not uncommon in our nation and world, and we have become somewhat de-sensitized to news of it. This incident has stunned us in such a way that even the most disconnected among us had to notice and react. To the questions of "Why?" and "How?" there are many factors to consider. We have a culture in which graphic violence is a form of entertainment. People (and children!) consume bloody violence as entertainment from movies, to mixed martial arts, to television series such as "The Sopranos," to video games, to romanticizing criminals such as Al Capone. There is a sick fascination with death and brutality in our culture. Yet, commentators continue to tell us that "studies" have shown no correlation between violence in media and violence in society. If this principle were true, why do companies (and political campaigns!) spend billions of dollars in advertising if media had no effect on the behavior of people? For sure, one will be hard pressed to identify a direct cause-and-effect between a single media/entertainment presentation and a violent act. What a simple study likely cannot show, even from an advertising perspective, is the cumulative effect of media messages and dramatic simulations on the mind over time, or the degree to which people respond differently. But we KNOW people are affected and persuaded. As details emerge about Adam Lanza, the shooter in the Sandy Hook school massacre, it is clear that Lanza was one of the increasing number of "anomalies" and deadly exceptions to the conclusions of studies that discount the impact of violent media. He was a troubled person living largely in isolation and an avid player of violent video games. He was from an upper middle class family and probably did not lack for any material thing. He was likely living an entitled and enabled lifestyle (not unlike the Columbine killers, Eric Harris and Dylan Klebold, who assembled weapons and bombs in Kliebold's parents' basement). Adam Lanza's mother exposed him to using weapons for recreation. He also used weapons in a digital world where all the targets are easy and no one shoots back. He was allowed to engage his violent fantasies in his mother's home. On December 14, at the beginning of the day, Nancy Lanza's own son shot her in the face while she slept in their home. When something tragic happens, especially a mass shooting such as Columbine, Virginia Tech, Aurora or Newtown, people begin raising the issue of "mental illness." They want to understand the factors and motives behind the actions of mass murderers. Psychology and Criminology cannot explain the actions of people like Adam Lanza. People like Lanza are not only dealing with "mental illness" they are dealing with hearts without Christ. Evil on this scale does not have a scientific explanation, especially in a society that wrongly views science as the explainer of all things, including God. The preventative to mass killings is not banning all guns, or trying to track all mentally unstable people (who are not necessarily pre-disposed to violence). The SURE PREVENTATIVE is to change the hearts of people. This is something only Jesus can do through the Word of God and the power of the Holy Spirit. Sadly and understandably, this solution is precisely what our larger society rejects as a matter of public policy, because they do not see God's light. As believers in Christ we should neither wait nor expect sinful society to accept or understand the grace and power of God. We need to preach the Gospel of Jesus. We must sow seeds of life and hope into the hearts of people. We need to transform our popular Christian culture from one of self-seeking, "spiritual" entertainment, and building our little (or big) church "kingdoms" into something more useful and effective in our society. We need less "pomp and circumstance" and more "salt and light." 1. We prayed more for family, friends, co-workers and fellow students in our community? 2. Churches made it they're aim to be active at public schools and pray over them? 3. We did not wait for the government to take action..realizing they are powerless to change hearts? 4. We did not allow our children to engage in violent forms of entertainment? 5 We made preaching the Gospel and sharing Christ part of our daily lifestyle? 6. Our country did not allow combat style weapons to be bought and sold, or offered a program to buy such weapons to help get them out of circulation? 7. You or I had the opportunity to pray for, and share the Word with, Adam Lanza? Yes, Jesus is the Answer! 2 Corinthians 5:17 Therefore, if anyone is in Christ, he is a new creation; old things have passed away; behold, all things have become new. 18 Now all things are of God, who has reconciled us to Himself through Jesus Christ, and has given us the ministry of reconciliation, 19 that is, that God was in Christ reconciling the world to Himself, not imputing their trespasses to them, and has committed to us the word of reconciliation. 20 Now then, we are ambassadors for Christ, as though God were pleading through us: we implore you on Christ’s behalf, be reconciled to God. Pastor Hudson, this is such a tragedy that words cannot even do it any justice to speak of. The word of God is the only consolation in this situation, Exodus 12:13 says "The blood will be a sign for you on the houses where you are; and when I see the blood, I will pass over you. No destructive plague will touch you when I strike Egypt. We have got to get back to basic salvation and PLEAD THE BLOOD OF JESUS OVER THIS NATION or we parish. As always, so practical, measured, and full of the Word. Thank you Pastor for your insights and VERY helpful article on important steps all of us can take towards minimizing this violence.